Louis and Zélie Martin, the parents of St. Thérèse of Lisieux, are the first spouses who were not martyrs to be canonized as a couple (October 18, 2015). Louis was a watchmaker, Zélie a manufacturer of point d’Alencon lace. They married in 1858 and had nine children. 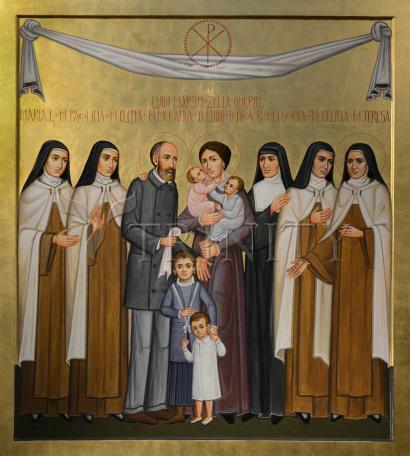 In this icon by Paolo Orlando they are pictured with the five daughters who survived to adulthood: Marie, Pauline, Céline, and Thérèse in the Carmelite habit, and Léonie in the habit of the Visitation. An inquiry into Léonie’s possible sainthood was opened in 2015. Also pictured are the four children who died young: Marie-Mélanie-Thérèse, Marie-Joseph-Louis, Marie-Joseph-Jean-Baptiste, and Marie-Hélène, who died at the age of five. Their Feast Day is July 12. Louis Martin was born in Bordeaux in 1823 and baptized Louis-Joseph-Aloys-Stanislaus. He grew up in Alençon and after school learned clock-making eventually opening his own watch-making and jewelry business on the rue du Pont-Neuf in Alençon. As a young man he wished to become a priest but it was not to be. Prayer was an important part of his life. He liked reading, fishing and walking in the countryside. His travels included his well-known pilgrimage to Rome in 1887 with his daughters Thérèse and Céline on the occasion of which Thérèse - still not fifteen years old - asked Pope Leo XIII for permission to enter Carmel. Zélie Guérin (christened Marie-Azélie) was born in 1831 near Alençon. She had a strong faith. She too wished to embrace the religious life and again it was not to be. Much is written of her great energy and capacity for work. She became a professional and talented maker of Alençon point lace and she also started her own business in Alençon. When Zélie was 26 years old she encountered Louis Martin on the Bridge of St Leonard over the Sarthe River in Alençon and had a premonition that they would marry. Three months later on 13 July 1858 the wedding took place in the Church of Notre-Dame now the Basilica of Notre-Dame in Alençon. Louis gave Zélie a silver medallion – which he had designed – depicting Sarah and Tobias. This medallion was used as the template for the commemorative medallion issued on the occasion of their Beatification. The couple lived in Alençon, initially at 15 rue du Pont-Neuf and later at 35 rue Saint-Blaise, where St. Thérèse was born. They had nine children only five of whom survived infancy and early childhood. The surviving children were Marie, Pauline, Léonie, Céline and Thérèse all of whom embraced the religious life. Marie, Pauline, Céline and Thérèse became Carmelite Sisters in Lisieux and were known respectively as Sr Marie of the Sacred Heart, Mother Agnes of Jesus, Sr Geneviève of the Holy Face and Sr Thérèse of the Child Jesus and the Holy Face. Léonie became a Visitantine Sister, in Caen, and was known as Sr Françoise Thérèse. Thérèse, their youngest daughter, was only four year old when Zélie died in 1877. After this Louis and his five daughters moved to Les Buissonnets in Lisieux. In 1887 Thérèse asked for and received her father’s permission to enter Carmel which she did in 1888.